After a career spanning three decades in the California community college system, Cuyamaca College President Mark J. Zacovic has announced his retirement, effective June 30. Zacovic has served as president of Cuyamaca College, with about 9,000 students in Rancho San Diego, since July 2011. He led the college through some of the toughest budgetary challenges in the institution’s 37-year history, ensuring that students continued to receive a quality education while dealing with dramatic spending cuts from Sacramento. Cuyamaca College economics professor Anthony “Tony” Zambelli has won the Roy L. Erickson Civic Education Award from the California Council for the Social Studies, an annual honor given to educators, community leaders or legislators for promoting civic education in California schools. Zambelli will receive the award March 7 in Oakland at the council’s annual conference. “This is truly an honor to be recognized for something I find so rewarding – to get young people to be more knowledgeable and engaged in civics in a way that’s fun and exciting,” Zambelli said. He has put on “We the People” competitions at Grossmont and Cuyamaca colleges for the past 27 years to encourage middle- and high school students to learn about the Constitution and their government. The future of science education in public and private schools will be the focus when more than 500 San Diego County teachers convene Feb. 28 at Grossmont College for workshops and seminars covering the Next Generation Science Standards, a set of expectations in science and engineering instruction similar to the Common Core. The San Diego Science Educators Association 24th Conference is 8 a.m. to 4 p.m. The event includes keynote speaker Richard Somerville, a world renowned climate scientist and distinguished professor emeritus at the Scripps Institution of Oceanography at University of California San Diego, and numerous exhibitors, including the Birch Aquarium, the Greater San Diego Science and Engineering Fair, the National Weather Service, San Diego Coastkeeper, Sally Ride Science Inc. and the UCLA Biomedical Library. “Anyone who is interested in science education in the region will gain a lot from this day of workshops and seminars,” said Michael Reese, Grossmont College’s dean of the Division of Mathematics, Natural Sciences, Exercise Science and Wellness. Aimee Cook’s plans were set. After earning a bachelor’s degree in kinesiology from Philadelphia’s Temple University in 2011, Cook figured she would come home to California and work as an emergency medical technician. Instead, she landed a job as an admissions representative in the emergency room at San Diego’s Sharp Memorial Hospital. It changed her forever. She enrolled in Grossmont College’s Nursing Program two years ago and hasn’t looked back since. Cook is set to graduate with an associate degree in June and is studying for her National Council Licensure Examination to become a registered nurse, and then earn a bachelor’s degree in nursing. 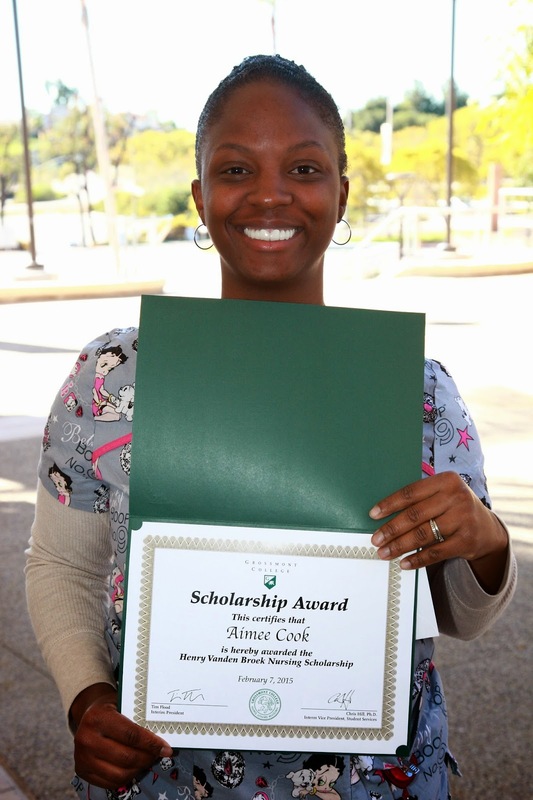 Cook’s dedication to the profession helped her capture Grossmont College's Henry Vanden Broek Nursing Scholarship. The award is provided to a second-year nursing student with financial need. try out the new courts. New tennis courts are opening at Grossmont College, featuring a design that is expected to prevent cracks, last longer, and have reduced maintenance costs. 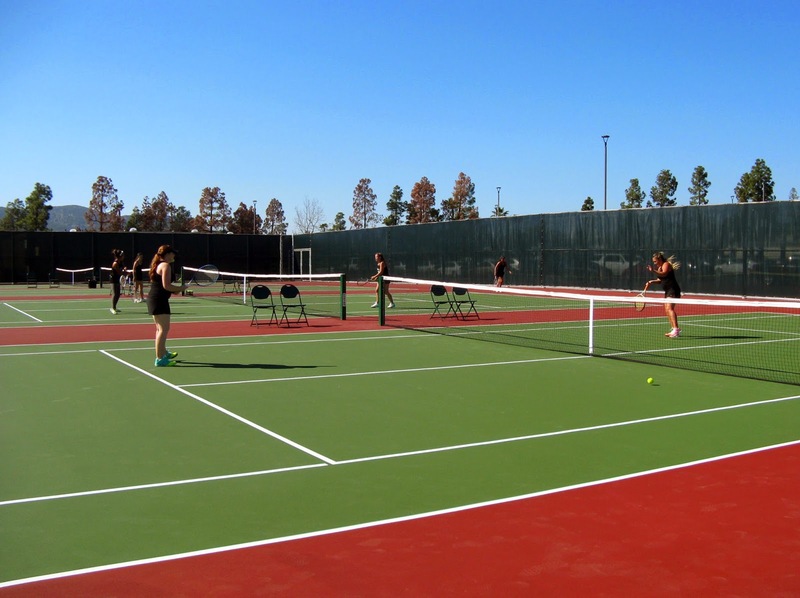 The 10 new tennis courts on the Grossmont College campus replace courts that were installed in 1967. The courts suffered from frequent cracks and drainage issues that limited their usefulness and required repeated repairs. The new courts feature a post-tensioned concrete slab reinforced with a grid of high-strength sheathed steel. The compressed concrete reduces the likelihood of shrinkage cracks and is recommended by the American Sports Builders Association to provide the best overall experience on the courts. Thanks to the delivery of office furniture donated by Jerome’s Furniture, Cuyamaca College’s recently opened veterans service office has taken on a fresh new look. Now, the college’s nearly 400 veterans have a comfortable, welcoming area where they can go to seek help with paperwork or to meet with a counselor to craft an education plan. 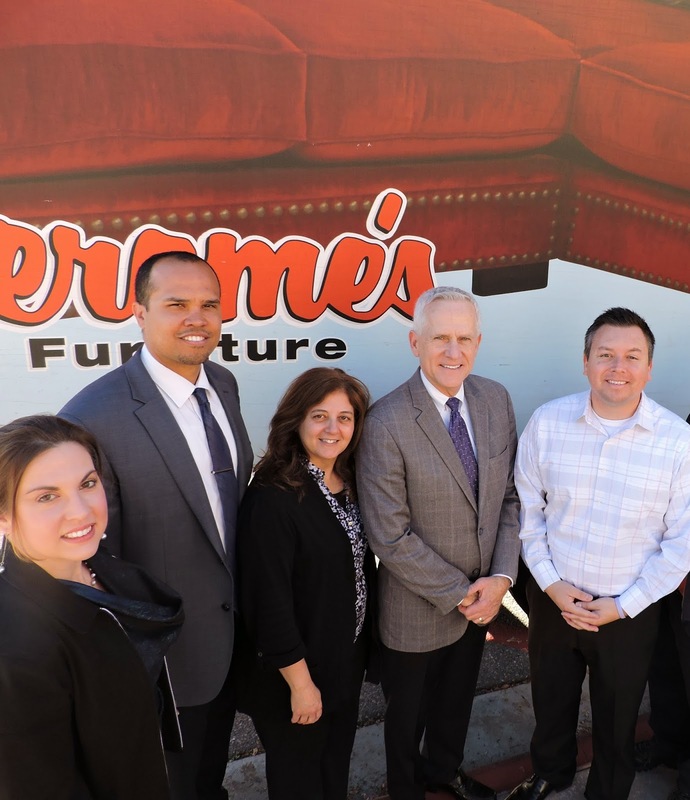 David Ramber, store manager from Jerome’s in El Cajon, said the more than $6,000 in new furniture, including chairs, desks, file cabinets and bookcases – a donation acquired through the Foundation for Grossmont & Cuyamaca Colleges -- is going to a worthy cause. The Filipino culture and traditions. Serving undocumented students. Diversity awareness as a leadership trait. Understanding LGBT issues. Recognizing social justice. These topics are on tap for spring 2015 at Cuyamaca College’s Diversity Dialogues, a series of workshops focusing on a variety of diversity awareness and social justice issues. The hour-long workshops have become well-established venues for discussions and exercises centered on always relevant, but often hot-button topics. This semester’s five workshops -- all to be held in the Student Center -- are free and open to the public. The workshops kick off with “Learning about Filipino Culture & Traditions” from 1-2 p.m. Tuesday, Feb. 10, in Room 104 in the student center. Presented by San Diego Filipino leader Sam Besa, the workshop focuses on the estimated 180,000 residents who make up the largest Asian American community in the county. The presentation will provide general information and an overview of Filipino history and culture. Besa, who has a bachelor’s degree in computer science from the University of California, San Diego, and MBA from the University of San Diego, is a 40-year resident of San Diego, and is a member of the House of the Philippines, one of the many culturally-based cottages that make up the House of Pacific Relations in Balboa Park. He emigrated from his native country as a toddler, then went back for several years as a child. Grossmont College will host its open house from 10 a.m. – 2 p.m., Saturday, Feb. 21. The event is designed for prospective students and will feature free application and financial aid workshops, campus and department tours, program and department information, and live entertainment. Faculty, staff and student volunteers will be on hand to help prospective students learn about the variety of academic programs, including certificate and associate degree programs, and student services provided on campus, such as counseling, financial aid and scholarships, among others. Workshops are designed to assist incoming students with completing the college’s free online application and the Free Application for Federal Student Aid, commonly known as the FAFSA. Live entertainment and campus tours will be available throughout the event. The event is free and open to the public; parking is also available for free that day. Grossmont College is located at 8800 Grossmont College Drive in El Cajon.